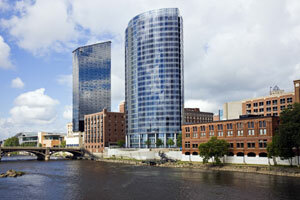 Grand Rapids is nicknamed “Furniture City” and is home to over 180,000 residents. Being home of former president Gerald R. Ford, Grand Rapids has a large tourism industry. One effective advertising opportunity is billboards in John Ball Park, Belknap Hill, and the Gerald R. Ford Museum where he is currently buried.There are also out-of-home advertising possibilities downtown near venues like the DeVos Place Convention Center and Van Andel Arena. Grand Rapids also offers digital signage ads in Fifth Third Ballpark home of the minor league baseball team the West Michigan Whitecaps. The major highways serving the city are another outdoor advertising possibility. Billboards on I-96, I-196, I-296 or U.S. 131 would yield high traffic billboard exposure of your business. Zip Codes: 49501, 49502, 49503, 49504, 49505, 49506, 49507, 49508, 49509, 49510, 49512, 49514, 49515, 49516, 49518, 49523, 49525, 49530, 49544, 49546, 49548, 49550, 49555, 49560, 49588, 49599.